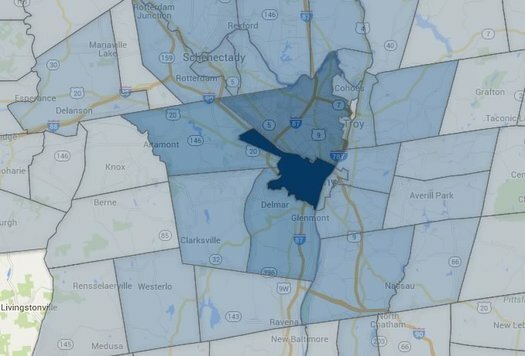 This map is a bit different -- it highlights which counties around the country were estimated to have people commuting to one of the Capital Region's four core counties. Unlike the maps above, we didn't draw the 50-commuter cut-off for this list. And as a result, some of the counties that show up have estimates with margins of error (sometimes greatly) larger than the estimate. Really, we just sort of put this map together to get a rough, smudgy sense of how widely the Capital Region core draws people. This post is basically a handful of interactive maps -- they're above in large form, click or scroll all the way up. + Of course, with any sort of estimate, there's a margin of error -- in some cases involving small groups of people the margin is relatively large. + Your mileage will vary.